It felt to be back in the tunnel so soon already. We had only just built it a few weeks back and we had barely used it except for when we were back on our portal destroying campaign. The exit still led up to the conducting tower - obviously - and I was beginning to wonder whether it was worth having another check there to see if they had managed to activate any more primary portals. It had been some time since we had checked, and probably longer since we had actually destroyed any. SERVERE had helped massively by destroying the ones we had initially found based on his coordinates, but we hadn't done much since then. We're getting ready though to put and end to that though once and for all, provided we're not too late. In a few short days we would be taking on HoN Co. from their own ground, where they had the advantage, but that's what we were preparing for. We know we couldn't completely destroy them then and there, but we didn't need to. We just needed to even out the odds by taking the Ender Eyes back. My only worry was that HoN Co. may be planning something to try and find us, especially as we have three of the Eyes. Unless they don't yet know what the portal is for, in which case they think we're stuck with the ones we have. "Where shall we set up? Should we lower the first door and try for a long one first or stick with the shorter range to gauge power and accuracy first?" I definitely thought the latter would be a better idea as we could work up to the larger distances when it was required. After checking the the magazine was securely in place and the safety was still on, I tested the cocking mechanism to make sure it was still tight. Amie came through from the lab holding a large piece of wood, about a metre squared. As she walked past me, I could see that she had drawn three large circles onto it, each decreasing in size from the last, much like an actual target. "Where do you want me to set it up? I'm assuming as far away as possible...?" "No no, just against the first door. We can see how far these things are accurate for, and whether there is any more work needed on the scopes or mechanisms." Amie set the board up against the first iron door, about half way up so we could determine the drop to be expected. We would have flawed results if we placed in on the ground as we would be playing to the effect of gravity before we had even fired. At about chest level - or at least level with the gun - was best as it gave us something straight and easy to hit. OROTHO waited for Amie to move away from the door, before putting the rifle up to his right shoulder, and sighting up the board on the far side. Holding the main body of the rifle with his left hand, in a slow and fluid motion, he slid the safety out and placed his finger on the trigger. I could see the end of the barrel quiver a little as OROTHO seemed to size up the centre of the target, but the motion was likely to be making things more difficult. I was about to suggest an idea to him when Amie beat me to it. She must have been thinking the exact same thing. 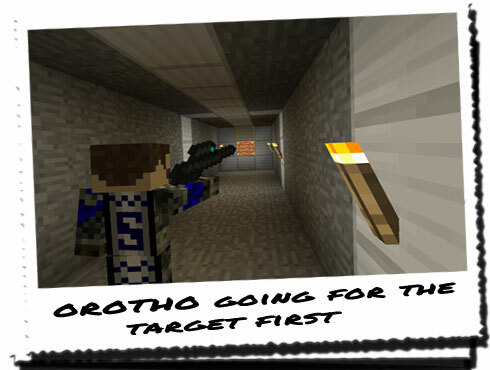 "OROTHO, try holding your breath before you aim. The rise and fall of your chest as you breathe in and out is what's causing the inaccuracy..."
OROTHO breathed in deeply through his nose, filling his chest, before attempting again, this time holding the rifle much steadier. Slowly, he squeezed the trigger, until the catch holding the spring was released, flinging the dart towards the far end of the tunnel where the door was. Putting the rifle down by his side, flicking the safety on as he did, OROTHO began to move towards the target at the far end, hoping to find where the dart had ended up. We knew the rifle had enough power to force the darts some way into the wooden surface, so we weren't so worried about power as we were about accuracy. We were using the optical sights that OROTHO had made, and assumed they had been mounted perfectly parallel to the main body and barrel of the rifle. Not only that, but no measurement had been made to determine if the scope was also perpendicular to the main body. If there was a slight discrepancy in the angle of either end of the sight, we may end up shooting higher or lower than intended. That's why these tests were being performed, but they were done so under pretty controlled conditions. Who knew how they would react under conditions with slight air resistance like wind. "That's pretty good for a first shot! I can't tell if it's my aiming or a slight alteration needed on the scope, but that's pretty close to the centre of the target where I was aiming." "How far away from it are you?" "About... Two centimetres up and to the left of the centre. If I knew the distance between my shot and this target, I could even work out the angle that's out by... Either way it means that the rifle is aiming more to the left than needed... Here, you have a go..."
OROTHO came back and handed the rifle to me; taking it, I made sure I was holding it comfortably before bringing it to my shoulder and removing the safety. Taking my own and Amie's advice, I inhaled deeply to ensure the rifle didn't rock so much as I held it. Thinking it was more likely to be the scope or the barrel that was off rather than OROTHO's aiming, I purposely aimed a little to the right of the target, hoping to compensate. Squeezing the trigger quickly, not wanting the barrel to sway away from my intended spot, I fired. I heard the dull splinter of wood on the far side of the tunnel, and went over to it after reapplying the safety. It was close, much closer than OROTHO's had been; it was literally a few millimetres to the left of the target, although still a little too high. 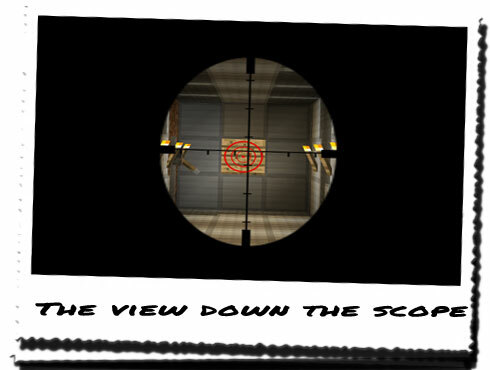 I think the scope was mounted at an angle where the end pointed to the right and slightly lower than the target area. That meant it would need shifting to the left, and the end would need bringing up ever so slightly. "Amie, are you going to have a go? We could do with a third opinion..."
Making my way back to the other two, I handed her the rifle, the barrel still pointed at the ground, and moved to one side to let her shoot. She seemed surprisingly more at home holding the rifle than I would have given her credit; moving it up to her shoulder, she followed the exact same procedure as me and OROTHO, before firing off another dart. Heading over to the target, she checked her accuracy and began to laugh, before slowly coming back to us. "How far from the target were you?" "Erm... Well let's put it this way: if the target was about a metre wider I might have hit it!" "The scope's not that badly out of angle is it?" "No, but I think I am! I'll leave you two to test it. If it's alright by you I'll begin work on the next one." Handing the rifle to OROTHO, Amie continued to walk towards the lab, still laughing to herself... OROTHO looked at me and I shrugged. We still had a lot of testing to do, and we had to recalibrate the scope to ensure it fired straight and true. The rest of the day was going to be very eventful! Me and OROTHO have been further testing both the prototype and completed rifle now for a few hours now; the minor alterations needed on the scope of the first we tested has been altered and now allows for a lot more accurate results. We had tested the main rifle as well, and had to alter the sights in a similar way, before re-testing them on the same target at the same distance. After we were happy that they could handle that distance, we took the target off the door, and opened it to allow us to go even further. I forgot how far the other door was to the first, and the walk to it to place the target up was a little longer than expected. Returning to the same position we had stood for the first door, I decided to go first; the target off in the distance still seemed surprisingly close up. I was hoping that it wouldn't have too much effect on the distance and accuracy, but that was what we were testing them for. Lining up the shot, I released the safety and squeezed the trigger. I tried to use the scope to pick up where the dart had ended up, but it was difficult to tell because of the odd angle. Handing the rifle to OROTHO, I made my way down towards the target again and tried to pick out where the dart had landed from a distance. As I got closer, I was able to make out the dart, a few millimetres south of the centre. That was pretty accurate! With a longer distance, the unknowns and variables that would effect it are magnified, including the movement of the barrel from my breathing. I was impressed with that, so much so that I went back and took another shot, only to find a very similar result! OROTHO then had a few goes, and we spent the remainder of the afternoon challenging each other by putting objects onto the target itself. I had a feeling that these rifles were going to be brilliantly useful to us out in the field!